So, what is an open ended toy? It’s the toy whose play potential is limitless and that grows with your child. You can’t play with it incorrectly; every child will find a unique way to power the toy. Take Tickle Me, Elmo, for instance. Convinced as I was that my son would simply adore Elmo’s adorable giggle, I purchased the furry red guy as a gift for my little boy when his baby sister was born. Suffice it to say that Elmo’s laugh rang through my house a handful of times at best. 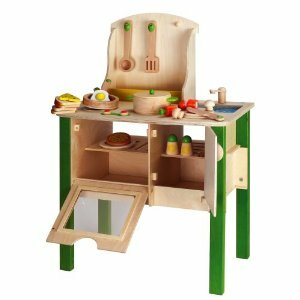 But the play wooden kitchen my siblings bought my son for Christmas when he was 18 months old? Well, it has earned a prime real estate location in our den where little hands fashion imaginary cakes, pizza, gelato and fancy caffeinated beverages for a coffee loving mamma. Thus, in the spirit of the summer when children run free through sprinklers enjoying all of the simple pleasures in life, I will use my next six to ten posts to share my picks for the best open ended toys for children. You just can’t go wrong with a play kitchen. Try to find a wooden set like the ones below. Unlike the unsightly and ubiquitous plastic kitchens, a finely crafted wood kitchen will nicely accent your home decor and will feel like a real piece of furniture to your children. It will also last you a lifetime, standing up to the test of many cooks in the kitchen. Options abound for lovely, natural play kitchens at every price point. I’d love to hear about the kitchens that grace your homes. While I now covet the kitchens I see on marvelous sites like the ones I’ve listed here below, I still love the blue wooden kitchen from Target we have in our home. As I leave you with a picture of my son at 2 with his play kitchen, I should advise you that the fun doesn’t stop when you buy your kitchen. Wait until you see the wooden and fabric cutlery, accessories and foods one can buy to outfit your new culinary space! Best looking chef I have ever seen.He can cook for me anytime. Candice – Ooohhh … let me help you shop! Send me a message with what you are looking for, price point etc., and I’ll send you a bunch of options. Even if you don’t end up buying one, we’ll have fun looking around. LOL. 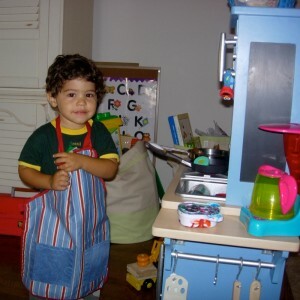 Nonnina – I’ll send my little chef right over. He’s an expert pizza maker thanks to all the practice he gets at your house! Well, I do have to admit that nothing builds the imagination like playing “chef”. I have had everything from worm soup to coffee with cream and sugar. And, the beauty of this type of play is that it spans all ages, bringing kids that ordinarily mgiht not play together because of varied interests, in the same kitchen. My sons (8, 5.5) play with their cousins Grace (2), Jay (almost 4) and Tatia (1) for hours. so true. I think even we adults like to “play house” every so often, even though we live the real version on a daily basis. I love the looks of your son’s play kitchen! Could please tell me the brand? I love it too. I bought it three years ago at Target for about $100. I wish now that I bought one that was handmade, but I must say that it has held up well through two children. It is used daily, and it is no worse for the wear. You can check Target, though I think they have changed the design a bit. It is called the Battat Kitchen Play Center. If you have your heart set on the one I have, I found it for you on Ebay (link below). Thanks so much for reading! I just ended up on your blog by accident somehow…and that blue kitchen is the one that I designed. It is soo fun to see your gorgeous little boy in his apron playing with it. My boys also spend a lot of time using it to make me fake soup. So glad you like it! Well, I have you to thank for that wonderful kitchen. It is still in daily use at my house. Almost 5 years later, and it looks brand new. When other children come over, it is the most played with item in my house. I saw a similar version at Target recently, but it is dark blue. Did you design that too? Honestly, I don’t know if we’ll ever be able to put it away because it is such an important play item in our home. Thank you for many, many hours of imaginative play and joy. What I love most about the design is that it looks nice in my home, has everything you need for a kitchen, and doesn’t take up too much space. Kudos to you! Do let us know what else you’ve designed for children! Oh, designing new stuff everyday….nope, didn’t work on the blue one that’s there now. I agree that the kitchen IS very sturdy and has kept well through lots of play. I hadn’t thought about it until I read it on your blog. My son actually climbed on the couch this weekend and then stepped on the little play shelf on the right side and it didn’t budge. After that Play Wonder line, my coworker and I went on to design a line called L’il Woodzeez (cute little animal world with a school,house, grocery store, bakery, etc), then the Baby Genius line at Walmart, and now I am actually working on dolls. My designs won’t be available until fall at Target…but if you have any girls, you should definitely check out the new website: OGdolls.com. It is very pretty. Next post: Amber Teething Necklaces … fact or fancy fiction?